Water deposits on glass shower stalls are both unsightly and annoying. In order to get rid of the water droplets from your beautiful glass panes within your bathroom, squeegees will undoubtedly be your absolute best choice when it comes to clean and clear glass. However, as we discover in the results below, not all squeegees are created equally. As you will quickly learn, they come in a variety of different form factors. 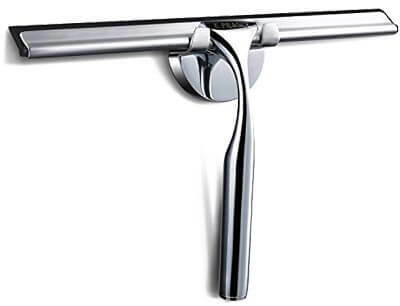 Handles are overrated, or at least, that’s what the Blomus shower squeegee would have you believe. This sleek and modern shower squeegee is everything you need to get your shower nice and clean. The single piece contains no jutting handles, instead choosing to go with an easily grasped stainless steel body that is dragged down to slide off water. 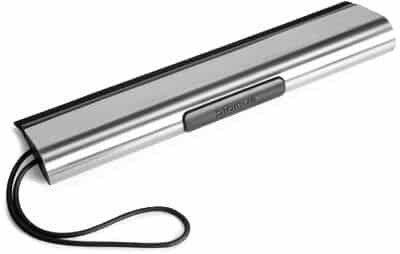 The body of the Blomus squeegee is made from stainless steel, designed to not rust while also being virtually indestructible. The only foreseeable problem with this design is that if you are not careful, you could have a new scratch all down your clean glass shower. The blade is made of rubber, and is attached firmly to the stainless steel body. This design makes refills impossible, but luckily, the blade is very strong and should last through months of showers. It is 9 inches long, just perfect for getting the entire shower done within minutes, but it could have probably been longer given that using this product is a little awkward at first. Overall, it’s a perfectly modern approach to squeegees that looks great in modern and conventional bathrooms. Modern bathrooms need modern tools to keep them looking fresh, and if you’re going to have a squeegee hanging in your shower, you want it to match the rest of your decorations. The Cleret Elite shower squeegee is a beautifully designed squeegee that looks and feels like it belongs in a science fiction novel. This handsomely white product employs two blades to ensure the best possible clean, and the easy to hold cylindrical handle ensures a superior grip. Both blades are flexible, which allows for cleaning of irregular surfaces just as well as they clean flat ones, adding to the convenience of this stellar product. There are no adhesive hooks or complicated mounts to screw into your wall when you want to store this squeegee. The Cleret Elite simply stands on its end, eliminating the need for fancy shower arrangements. On a shelf or on the floor, this squeegee is great to store anywhere, and because it’s so small, it doesn’t take up more room than a shampoo bottle. 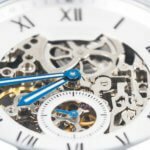 The one thing to watch out for, especially with the dual blades, is the build-up of mold along the edges and in the creases. You may have to wash the blades regularly in bleach to prevent this from happening. The problem with metal shower squeegees is that they are significantly heavier to that of plastic, and, when dropped, can damage your floor or seriously injure your foot. Using metal squeegees also opens up the risk of scratching your delicate glass surfaces permanently. With the Cleret iDo shower squeegee, you don’t have to worry about scratched surfaces or broken toes again. This 3.9 ounce tool is made from plastic and rubber, meaning it is lightweight and safe for delicate surfaces. No more worrying about leaving a scar on your expensive glass shower. Additionally, this squeegee employs a revolutionary 2 blade technology that leaves surfaces cleaner than single blade window wipers. The blades measure in at 12 inches long, which helps to cover a lot of area at once for extremely fast cleaning. They are also stacked so that the shorter of the blades gets the majority of the water and fog, while the longer one catches everything that may be left over. This results in a virtually streak free clean that leaves your shower pristine. The blades are durable, and are guaranteed to last even with multiple people showering every day, but should the blades break, they can be replaced for cheap. 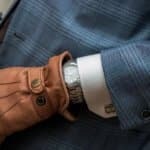 The ergonomic handle design is comfortable to hold, and also stylish enough to leave in plain sight. To store, simply use the attached wall mount to stick onto any smooth flat surface. When using a squeegee for small jobs, such as cleaning mirrors or getting into tight, hard to reach corners (such as for a car), a large blade just won’t cut it. 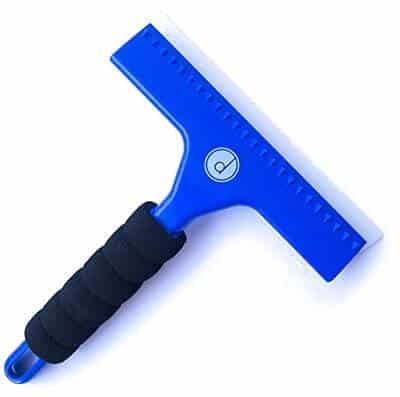 The Desired Tools squeegee is perfect for hard to reach places and small scale jobs due to its size. This plastic squeegee possesses 8 inches of dual blade, ideal for car windows, bathroom mirrors, and glass doors. Because of two blades instead of one, it collects additional moisture that single blade squeegees miss on the first swipe, eliminating the need to go over the same spots again. This makes for an efficient way to clean even with a smaller blade, meaning less time wasted cleaning, and more time doing what you love. The handle is surrounded with a thick foam which helps maintain a firm grip while cleaning your shower. It’s ergonomically designed to be easy on the hands, and comfortable during use. The handle is about 10 inches long, and is not telescopic which means you will have to reach to get at some places, but it fits very well for most projects. One of the downsides is the foam may retain moisture, and the dual blades need frequent cleaning to keep mold and mildew from growing in the cracks. Otherwise, it is a very solid piece that works for what you need it for. Streaking is a huge problem when you use cheap squeegees to clean your glass. You want something that is easy to handle while also leaving your shower doors spotless. Cheap plastic squeegees get warped over time, and if you have a foam handle, it quickly becomes a bacterial breeding ground. For these problems, and many more, you want a metal shower squeegee. The E-PRANCE shower squeegee is ideal if you want a streak and spot free shower. 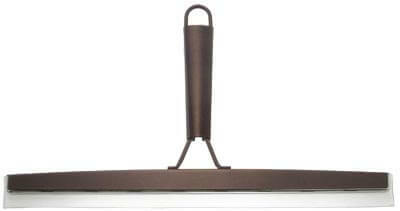 This squeegee can be used on tile, glass, mirrors, as well as for jobs outside of the bathroom such as cars and windows. It’s a great way to ensure that all of your glass and mirror cleaning needs are met. This metal squeegee is made from a zinc alloy to prevent rusting, plus it does not hold on to bacteria the same way a plastic or foam handle will. The downside to this is that is does become a bit slippery to hold if your hands are wet, but working with dry hands should not pose too much of an issue. The blade is 10 inches long, and the handle is 7 inches, making for a compact but effective way to thoroughly clean your shower in a short amount of time. The blades are reversible, so when you are done with one side, you can simply unlatch the blade to flip it around. Refills are also very common, and can be sold in most hardware stores. The InterDesign bathroom squeegee does a clean shower differently. Where regular squeegees are blade and handle, with the option to remove the blade for easy replacement, the InterDesign is all blade, removing the handle entirely. This creates some interesting usage differences. Without a handle, controlling the squeegee results in simply holding the blade at an angle and dragging down. When you are done, hang up the blade for use next time. The blade is very stiff, and does not allow for a lot of flexibility. For flat glass shower stalls, this is theoretically ideal as you can get every bit of water in one go. For ripples or dips in the glass, it is significantly harder to get all the mist in one sweep. The same goes for tiled bathroom walls. In practice, even with flat bathroom surfaces it appears that this squeegee is virtually unusable. The product is so stiff that trying to capture all of the water without streaking is a dream yet to be achieved. Controlling the squeegee with wet hands also seems to have it’s own problems. Sleek and modern in design, but it appears this product should have been left at the drawing board. Modern decorating got a little easier with fashionable squeegees to hang in your showers. The InterDesign Forma shower squeegee is the perfect blend of elegance and class, with a brushed bronze look that’s sure to tie the whole bathroom together. This squeegee features a 12 inch blade for optimal shower cleaning, and a 7 inch handle to allow even larger hands to grab comfortably. The blade is made of a super pliable material that slides across flat and textured glass effortlessly, meaning you spend less time cleaning and more time enjoying the things you love. The body is made out of metal, and also comes in colors such as brushed stainless steel and clear. This gives you ultimate control over what you decide to display in your bathroom. To hang this squeegee, there is a handy hoop on the end of the handle that allows you to hang it on a hook virtually anywhere. Because it is made of mostly metal, you do run the risk of scratching ad scraping your delicate glass windows, but if you are careful it should not be too much of a problem. One thing that buyers do note, however, is that occasionally the squeegee will make a horrific squeaking noise. Other than that, it is a cheap and effective product that cleans your windows. There are some home essentials that should not be overlooked, and if you have a glass shower, then a good quality squeegee is one of them. Investing in a quality shower squeegee will save you time and money in the long run, plus it will ensure that your shower looks great every time you enter it. 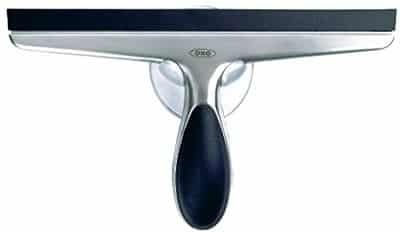 OXO Good Grips squeegee is primarily made from stainless steel, and features a soft grip handle that allows you to hold onto the squeegee even when wet. It has a long 10 inch blade that lets you clean more with fewer swipes, and the 6 inch handle is perfectly shaped to fit in the palm of your hand. The blade itself is very flexible, so showers with rippled surfaces can experience the streak-free clean that you would get on smooth flat glass. When you are done with the OXO squeegee, simply attach it to any smooth flat surface with the attached suction cup to prevent mold and mildew from forming on the handle and blade. It’s a convenient little tool that makes cleaning all of your indoor and outdoor glass a snap. A spotless shower can make the entire bathroom sparkle. With glass shower stalls and doors, the fog build-up may seem harmless, but if left untreated, it could cause your crystal clear glass to become dull and dirty over time. Using a squeegee can help minimize dirt buildup and keep your shower looking good for longer. 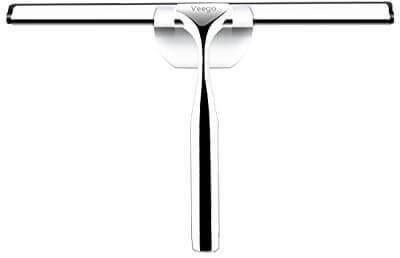 The Veego Shower Window Squeegee is a stainless steel shower scraper that pulls off water and dirt quickly and easily. With a 9.84 inch rubber blade, this product can cover a lot of surface area very quickly. It’s also easy to assemble, and comes with it’s own wall mounted storage bracket to save space when not in use. The body of the Veego squeegee is made from a high quality zinc alloy that guarantees a rust free life. The 5.91 inch handle is smooth and pristine, just like your shower stall should be. Using this squeegee is also extremely easy, as the handle is designed to fit in the hand for optimal movement. There is some assembly required prior to using it, but it is simple enough that putting this product together takes less than 5 minutes. Enjoy a cleaner shower, even if it’s not made of glass. 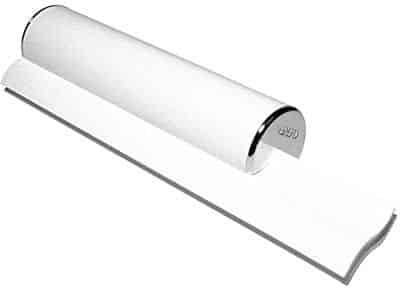 The Veego shower squeegee works on all types of bathroom tile, glass, mirrors, and more. Its uses even extend beyond the bathroom; you can use this product on the windows of your house and car as well. Streak free, grime free, and surfaces are dried in minutes, this is a great little product for all of your glass and mirror surfaces. Looking for a modern age shower squeegee that goes with the rest of your bathroom? Tired of having handles that are too short, too long, or hold onto moisture like a camel holds in water? The Zack Puro bathroom squeegee may just be what you need. What is unique about this squeegee is that it actually has no handle. This may seem like an odd design choice, and it is, but it does still work very well in comparison to other models on the market. Holding this handle-less product does take some getting used to; some buyers have described it as being akin to pulling down a window shade. However, it should not take too long before you get in the rhythm of squeegeeing your shower with this innovative tool. The body of this product is made from brushed stainless steel, and the rubber scraper is fastened firmly onto the body. The manufacturer claims that this product is non breakable, but it is unclear whether they mean the stainless steel body or the short rubber scraper. Accidents do happen, but because the rubber scraper is attached to the steel body, replacements are out of the question. If you do manage to somehow crack the rubber, you are looking at purchasing another squeegee. Have no worries, because for the price that the Zack Puro Squeegee is listed at, it should last you a long time. When reviewing all the top shower squeegees that we have outlined below, many of them come in a variety of mount types. Suction – By and far the most popular option used by manufacturers will be the suction cup variety. Suction cups are great for their portability, especially if you are currently living in an apartment and plan on taking your squeegee with you when your lease is up. However, by and far one of the main downfalls of the suction cup mount type will undoubtedly be the lifespan. For most shower squeegees, those that rely on a suction cup will often last on average about 12 to 18 months. After that time, the plastic of the suction cup will start to dry out and deteriorate leading to degraded performance. At this time, many folks with either just simply order a new suction cup for a replacement or start to set their squeegee on the ledge. Suction cups will perform best on glass – which can be an annoyance for those who want to have a fully unobstructed glass pane. Tape – Tape can be incredibly effective at keeping your squeegee in place for a few years – even in the direct spray of a high pressure shower head. 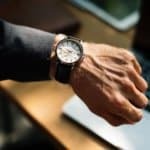 Typically fastened with a high quality adhesive, while tape backings are terrific for their longevity, they often fall short on their portability. Therefore, if you are renting, there is a high likelihood that the tape backing will remain on the tile or glass long after you remove the hook. 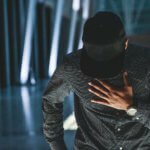 This could, in some cases, lead to fines upon the final inspection at the end of your lease (depending on how strict your landlord is). However, another large downfall to tape backings is their permanent placement. Should you accidentally affix your hook slightly crooked, you have very little in the way of wiggle room, so be sure to measure appropriately otherwise your squeegee will always be hanging in a awkward manner. 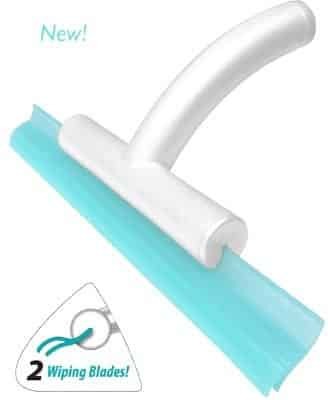 Hanging – The hanging variety of shower squeegees provide the best of both worlds when it comes to their tape and suction counterparts. A simple loop at the end of the squeegee handle like that found on the Blomus Shower Squeegee will allow you to easily hang the shower squeegee from your favorite shower head or shower caddy. When it comes to deciding the blade size of your shower squeegee, you will want to make measurements within your bathroom. If you have any narrow panes of glass, measure to see what their total width is. Should you purchase a squeegee that is too wide, you may have difficulties getting the glass pane completely clean as you will need to squeegee at an angle. We would recommend at least .25″ of wiggle room to ensure a clean and frustration-free finish. As you can see within this article, shower squeegees either come in a plastic or stainless steel finish. If you like to have a little bit of heft when you pick up a squeegee, then you will want to go with the stainless steel handle. However, should that heavier squeegee ever fall from your hands, there is a very real chance that it may cause a crack in any tiles you have installed on the shower stall floor. In addition, should the squeegee ever slip and hit your toes, this too could be incredibly painful! Therefore, we like to recommend that those looking for a shower squeegee go with a plastic handle instead. While plastic may feel cheap, the blade on the end of the squeegee is no different than one that is on a stainless steel squeegee. Therefore, there will not be compromising on the performance.